MoonProject – Don’t Shelve The Sangria Just Yet! You are here: Home » Cooking » Don’t Shelve The Sangria Just Yet! Don’t Shelve The Sangria Just Yet! The beginning of September is a noteworthy part of the year. The 1st is the day the wreckage of HMS Titanic was discovered (and subsequently the ship’s magnificent cellar housing 12,000 bottles of wine – many of which were still intact). It’s independence day in Uzbekistan. It’s Gloria Estefan’s birthday. It is also the 244th day of the year – a scary thought, quite frankly. On a personal level, I’m not a fan. The unwanted arrival of September means summer is coming to a close. We can wave goodbye to quiet roads in London. We must trade in our flip flops and dig out more sensible shoes. At the end of last month I reluctantly binned the August page of my calendar (using a bit of artistic licence here; I don’t actually use a paper calendar but it’s far less poetic to say “click the September button on my Google Calendar”). The change in season inevitably leads to a change in drinking habits. It’s a lot less fun drinking rosé and eyebrows are raised when you order sangria. Pub gardens resemble ghost towns and al fresco dining becomes a mystical creature of the past. But I’m not ready to let go – not just yet. I am going to write about sangria as my last attempt to wave the flag of summer one last time before conceding to the supreme being of meteorology. 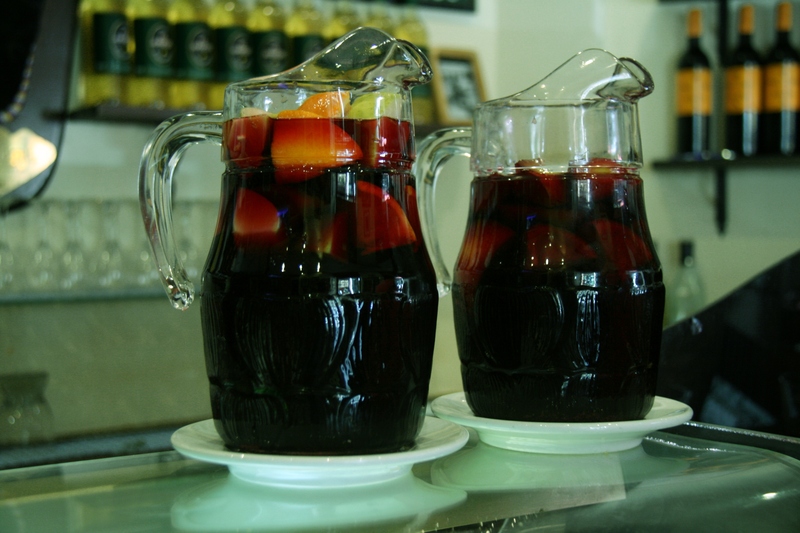 Originating from Iberia, sangria is a popular summer drink made by combining wine, fruit, sugar and brandy. As of January this year, new EU regulation means that bottles labelled as sangria must be produced in either Spain or Portugal. Red wine is often used which gives it a blood red colour (the word ‘sangria’ actually comes from the Spanish word for “blood” – go figure); if you’re making it at home, choose an inexpensive, fruity, relatively full-bodied red such as garnacha or merlot. If you don’t like the sound of a blood red drink, no fear – sangria can also be made with white wine (“sangria blanca”), rosé (“sangria rosado”) or a sparkling wine such as cava. Keep it authentic by using a Spanish or Portuguese wine. The choice of chopped fruit often includes oranges, lemons, limes, raspberries, strawberries, pineapple – don’t hesitate to count it as part of your ‘five a day’. When it comes to making sangria, I’m a fan of simplicity. Choose your poison: red wine, white wine, rosé, sparkling wine. Add in a dash of brandy and orange juice (optional but recommended). Throw in a couple of tablespoons of sugar (“a couple of” is pretty vague I know, but I do think sangria should be sweetened to your personal taste. I’m not keen on overly sweet drinks so I’d personally use just a pinch – but that’s just my preference). Chuck in your lovingly chopped fruit (and don’t skimp on the ice). Chill it in the fridge for a few hours (a bit of patience goes a long way here. If you don’t have the time or inclination to wait, at least chill the red wine beforehand). Pour it into wine glasses filled with ice (and a bit of chopped fruit if you want). Sangria a great choice if you’re hosting a summer party – it’s very simple to make and your friends will think you’re a bloody good mixologist. Even more so after a few glasses. Author: shakirachanrai Founder of Grapeful, an app that helps you pair wine with food, explore wine by country and style, choose wine for an occasion, impress your date with geeky facts about wine, and much more. Grapeful is free to download on iPhone and Android devices.